This article previously appeared in issue 14 of The Monad.Reader. In the following, I’ll present a series of solutions that gradually include dichotomic search (the straightforward generalization of binary search), stack-based languages or reverse polish notation, and finally deforestation (also called fusion), an optimization technique specific to purely functional languages like Haskell. For your convenience, source code for the individual sections is available. -- --- .-. ... .    -.-. --- -.. .
> decode "-- --- .-. ...    . -.-. --- -.. ."
and use Data.Map.lookup instead of Data.List.lookup. Faithfully replicating the morse code table is clear and preferable, but makes for quite large source code. So, let’s make an exception today and think of something as clever as we can. At each node, the left subtree contains all the letters that can be obtained by adding a dot to the current letter, while the right subtree contains those letters that can be obtained with a dash. This is illustrated by means of a dotted line connected to the left subtree and a dashed line connected to the right subtree. Now, to decode a letter, we simply start at the root of the tree and follow the dotted or dashed lines depending on the symbols read. For instance, to decode the sequence "-...", we have to go right once and then left thrice, ending up at the letter B. This procedure is also called dichotomic search because at each point in our search for the right letter, we ask a yes/no question “Dot or dash?” (a dichotomy) that partitions the remaining search space into to disjoint parts. In this case, the accumulated value of the fold is the current subtree, although the term “accumulate” is a bit misleading in that we don’t make the dictionary bigger; we make it smaller by passing to a subtree. The curious reader may notice that we have actually implemented a trie. Compared to the association list, we got rid of the dots '.' and dashes '-', they have been made implicit in the structure of our tree. But we still need a lot of parenthesis and applications of the Branch function. which calculates the sum (1+2)+(3+4). To build our dictionary tree, we are going to devise a very similar language. Instead of integers, the stack will store whole trees. In analogy to the numerals, there will be an instruction for pushing a Leaf onto the stack; and in analogy to +, there is going to be an instruction for applying the Branch constructor to the two topmost subtrees. program = "__5__4H___3VS__F___2 UI__L__+_ R__P___1JWAE"
++ "__6__=B__/_XD__C__YKN__7_Z__QG__8_ __9__0 OMT "
The stack xs is represented as a list of trees. We have found a concise way to represent the morse code dictionary in source code, but cleverness does not end here. For instance, how about eliminating the tree entirely? More precisely, it seems wasteful to construct the dictionary tree by creating leaves and connecting branches only to deconstruct them again when decoding letters. Wouldn’t it be more efficient to interpret the morse code tree as a call graph rather than as a data structure Tree Char? If the next symbol is a dot or dash, we proceed with the functions i or a corresponding to 'I' and 'A' respectively. And in case we have already reached the end of the code, we know that we have decoded an 'E'. The functions i and a work just like e, except that they proceed with other letters; and the morse code tree becomes their call graph. Now, writing all these functions by hand would be most error-prone and tedious, they all look the same. But abstracting repetitive patterns is exactly where functional programming shines; we are to devise a combinator that automates the boring parts of the code for us. if we inline the function definitions. But this is of course just the tree from the section on dichotomic search with each Branch replaced by branch! is a trivial replacement for the Leaf constructor. To further understand how and why the replacement of Branch by branch works, it is instructive to derive it systematically from just the program text. In this formulation, the focus is on the recursion over the input string performed by foldl, neglecting the recursive descent into the dictionary tree. Let’s systematically rewrite this code to highlight the latter. In other words, decodeWith takes a tree and simply substitutes each Leaf constructor with leaf and each Branch constructor with branch. Of course, first using Branch and then replacing it with branch is a waste; we should rather use branch from the start and thus cut away the intermediate tree. That’s exactly what we’ve done in the previous section! It’s the good old fold! And at its heart, it just replaces the constructors of the list data type: z is the substitute for the empty list , and f is put in lieu of the (:) constructor. In its honor, any function that substitutes constructors in such fashion is known as a generalized fold. A more exotic but commonly used alternative name is “catamorphism”. In other words, decodeWith is a catamorphism. Merging two functions in this fashion is also called fusion. Performing deforestation manually, as we did, sacrifices reusability: the morse code tree only exists as a call graph and cannot be printed out anymore, and sumFromTo is not nearly as useful as are sum and enumFromTo were. Hence, the goal is to teach the compiler to automatically fuse catamorphisms with their structure creating counterparts, the so called anamorphisms. That’s what efforts like a short-cut to deforestation and the recent stream fusion are set out to do, yielding dramatic gains in efficiency while preserving the compositional style. can be deforested as well and fused into the letter decoding. Try it yourself, or see the example source code. Polish notation, the converse of reverse polish notation, puts function symbols before their arguments and is thus closer to the Haskell syntax. When the arities of the functions are known in advance, like 2 for Branch and 0 for Leaf, this notation doesn’t require parenthesis either. Write a program in polish notation and a corresponding tiny interpreter to create the morse code tree. Since deforestation is supposed to make things faster, how about comparing our deforested morse code tree to say an implementation in C? But instead of doing benchmarks, let me give two general remarks on the machine representation. First, one might think that the call graph we’ve built is compiled to function calls, with e calling i or a and each function having different machine code, just as we originally intended. But this is actually not the case. When defined with branch, the functions are represented as closures, sharing the same machine code but carrying different records that store their free variables c, x and y. This is not very different from storing c, x and y in a Branch constructor. Template Haskell or some kind of partial evaluation would be needed to hard-code the free variables into the executable. For more on the Haskell execution model, take a look at the GHC commentary. Second, all our implementations decipher a letter by follow a chain of pointers: descending a tree means following pointers to deeper nodes, and making procedure calls means repeatedly jumping to different code parts. This of course raises questions of cache locality, branch prediction or memory requirements for storing all these pointers. Here, the tree is represented as an array and paths to nodes are encoded as (zero-less) binary numbers. The program calculates the path t to the proper letter and then fetches it with an O(1) memory lookup. 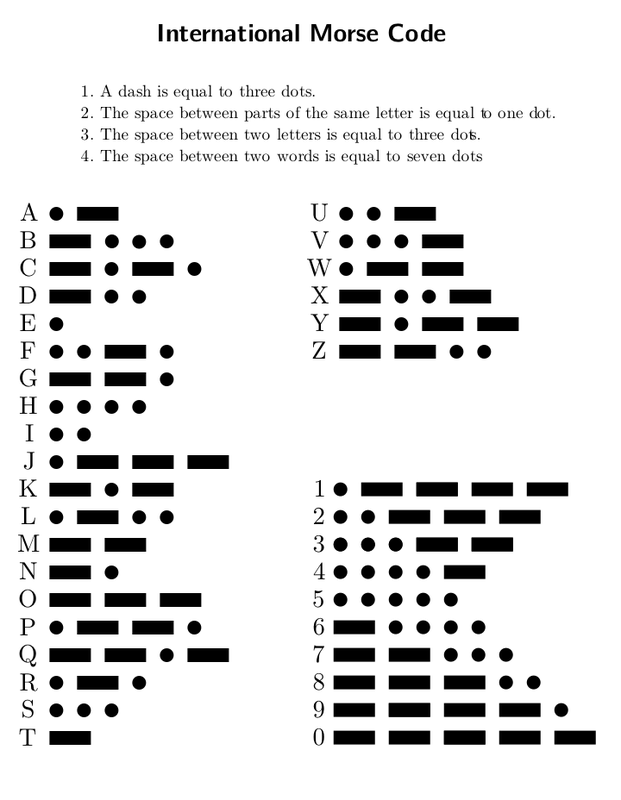 Compare also the morse code translator by reddit user kayamon. Since the number of memory accesses is kept to a minimum, this technique is the most efficient; but it is impossible to reproduce with algebraic data types alone. Fortunately, arrays libraries are readily available in Haskell as well. The main drawback of this approach, and of arrays in general, is the lack of clarity; indices are notorious for being non-descript and messy. The raw index arithmetic in the example C code above sure seems like magic! Such magic is best hidden behind a descriptive abstract data type. How about rewriting the example in Haskell such that decodeLetter looks exactly like the one in the section on dichotomic search? In other words, the abstract data type is to support the functions left, right and tag. One possible solution can be found in the source code accompanying this article.